A three year investigation on Carlos Buela conducted by His Eminence Bishop Taussig ended up in the resignation of the Founder and General Superior of the Institute of the Incarnate Word Rev. Father Carlos Miguel Buela. In a letter sent on May 8th to His Holiness Benedict XVI, the Founder of the Institute Carlos Buela presented his resignation. The interesting and sad part of the letter is what it can be read in the between lines which is some type of understanding or agreement between the Pope and the Founder of the Institute. The allegations of misconduct and abuse against the priest ended up in requesting the intervention of the Institute but it seems that they have negotiated a prevention of intervention for resignation of the Founder Carlos Buela. I write to His Holiness with feelings of profound gratitude because you have benevolently received my suppliant prayer of passed March 8th. I have spent most part of my life founding and carrying on the Institute of the Incarnate Word. Now I am older and with some health issues, at the same time the Institute has grown a lot. The infinite Providence of God has made it flourished (The Institute) in many places and with abundant vocations, and today is consolidated in its structures of formation and govern. On another note (side), since our beginnings and at the present time we have gone through numerous difficulties, in which we have experienced God loving care. As Sons of the Holy Church, our Religious Family also journeys in the World in between the consolations of God and the persecutions of men (Saint Augustine). I consider this an immense grace from God. As I expressed to His Holiness in my suppliant prayer, I consider this the right time to resign again from the office of General Superior, as I did already one time in 1994. So, by this mean and in good disposition, I present to His Holiness my resignation to the office of General Superior of the Institute of the Incarnate Word. In particular I would like to thank His Holiness for the decision of no sending of a Pontifical Commissary to the Institute, so this way, after my resignation, the authorities of the Institute according to the Constitutions continues carry on with it. I am deeply thankful for the goodness showed to me and other members of the Institute, I give you my greeting and implore your paternal blessing and I assure you we will keep you in our prayers. This letter was sent by Rev. Gonzalo Ruiz-Freites by email, asking to priests of the Institute of the Incarnate Word (IVE in Spanish) for complete and total secrecy. I am sending you the text that Fr. Buela will give in the next days. We have asked Provincials to inform you about the current situation, according we have been informing them in a private way in e-mail March 6th, March 8th, March 21st , April 9th and April 30th. The information in here is strictly confidential. You cannot talk with anybody out of Institute [laity, parents, Servants (nuns), etc] If somebody ask you or make a comment, send them to the suitable Provincial. We put this situation in Mary the most holy, confident in her lovely protection, asking the grace of being very unite to our Founder. The letter was filter to the media in an effort to show the cracks of trust within the institution and the unfair ways of handling these kinds of situations by the Catholic Church. There are still many things to repair, follow up and make better in the Church. Abuse must be stop, any kind of abuse, sexual, power, psychological or sociological. There are many Cardenal, Bishops, priest, and religious people that still don’t get it. We are not going to grow stronger from this chaotic situation if we keep compromising with hypocrisy. Pope calls such outrageous names (“The Abusers … Founders”): Marcial Maciel, Gino Burresi, Alphonso Duran, Carlos M. Buela. On the first three may find the information. And what’s the guilty Carlos M. Buela? He is on a par with pedophiles. Does this mean that Buelah has to do with it? Why are so carefully concealed information about this person? Father Buela is almost a saint, he was persecuted by some people from the same church because the IVE has an immense amount of vocacions and they have such a strong feith they are capable of leaving anything to persuit God’s Will , they are sent to places where nobody would go, and apparently this generates envy in other members of the Church . Just one little note: The holiness of a person is not measure by the size of the institution. Holiness is based on personal merits. Ironically Fr. 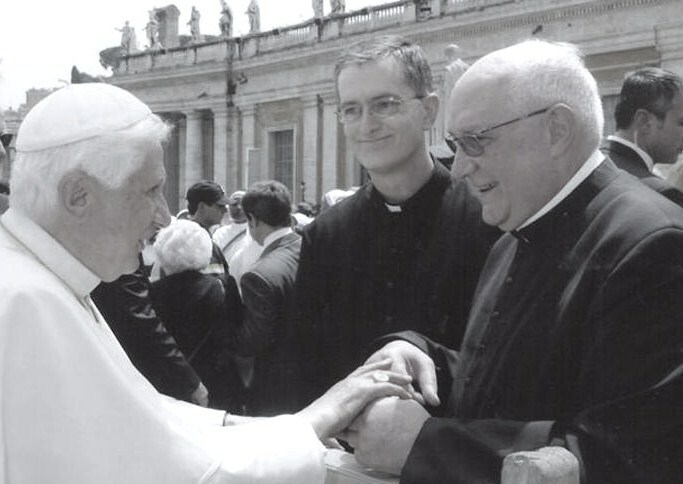 Maciel have been ‘blessed’ with many more vocations in the Legion than Fr. Buela in the IVE. fr please i need your prayer for my family,pls tell God to shower his Blessing upon us.we are suffering from hunger in Nigeria. Do we have an spanish copy of the resignation letter written by Fr. Buela? The english version is so badly written, as it is the whole article — it almos seems like the same person wrote them both, letter and the article. Just saying… 🙂 Good day! Julie, I’m sure the original for both were in Spanish and what you are getting is a google translated version – which is why they both sound the same and are both clunky. If you want to google around in spanish you’ll find it. You can start on chatdecafe.wordpress.com probably. Julie, the original post on the resignation and a link to the spanish version of the letter is here on the same site. In the future it might help to do at least a google search before you cast aspersions on the OP. Just sayin.